I occasionally like to make my own nut butter by grinding nuts in a food processor and adding some coconut oil until it becomes creamy. But I’m worried that I’m losing some of the fiber in the nuts when I grind them. Also, does eating nuts burn more calories than eating nut butter? As far as the fiber content goes, don’t worry, unless you blanch or otherwise remove the outer layer of the nuts before you process them. Some of the fiber in nuts comes from the skin, so be sure to include the outer layer (not the shell, of course, but the skin around the nut) when processing. 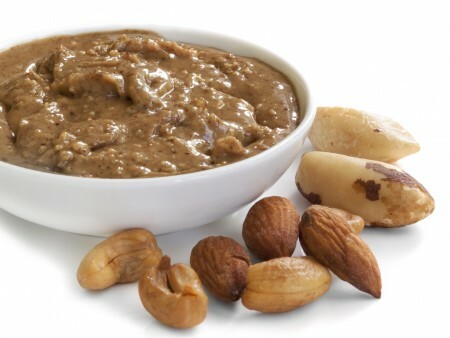 It’s true that eating nut butter is a totally different, less crunchy experience than eating nuts, but you won’t lose any of the nut’s fiber by grinding it into a powder, paste or butter. It’s good that you’re thinking about fiber. Most Americans don’t eat nearly enough: Women should get 21 to 25 grams a day, while men should get 30 to 38. While nuts and seeds can be a good source, keep in mind that fruits, vegetables, beans and whole grains are often even better sources. However, a word to the wise about the coconut oil you’re using to make the nut butter smoother and more spreadable: You could be paying a high price for that convenience. Even though the internet is plastered with pages touting the health benefits of coconut oil, actual researchers of fatty acids and body energy metabolism are far from convinced. Although the saturated fat in coconut oil contains medium-chain triglycerides that are thought to provide some health benefits, the detrimental palmitic acid in coconut oil far outweighs any potential dietary benefit in humans. Palmitic acid promotes the formation of belly fat and fat in the liver. If you feel the need to add some type of oil to your nut butter, you’d be better off using another type of light-tasting or flavor-complementing oil with a higher level of healthier polyunsaturated or monounsaturated fat, such as peanut, walnut, grapeseed, sesame, sunflower or safflower oil. Finally, don’t be too concerned about the difference in calories that your body burns between eating whole nuts and eating nut butter. The difference would be minuscule. On average, only about 10 percent of the calories your body burns is due to digestion (including chewing) and absorption of nutrients, compared with 30 percent from physical activity (including any type of movement) and 60 percent from basal metabolism. Interestingly, a small study in the New England Journal of Medicine — notably, in a letter to the editor, not a peer-reviewed journal article — back in 1999 calculated that the energy burned in an hour of chewing gum averaged 11 calories. The researcher suggested that chewing calorie-free gum during waking hours all day every day could result in the loss of several pounds over a year, and its effects shouldn’t be discounted. But you wouldn’t be chewing nuts for that long. The difference in calories required for digesting nuts as opposed to nut butter is likely indistinguishable. Editor: This column was reviewed by Dan Remley, field specialist in Food, Nutrition and Wellness with Ohio State University Extension, and Martha Belury, a scientist with the Ohio Agricultural Research and Development Center and the Carol S. Kennedy Endowed Professor of Human Nutrition in The Ohio State University’s College of Education and Human Ecology.